Welcome to the link party! I hope everyone enjoyed celebrating the men in your life on Father’s Day. We had a great time strawberry and bunny picking. 🙂 Isn’t that baby bunny the cutest? Features from last week’s party will be up this week! If you’re new to this party, I’m so glad you stopped by. The Tutorials & Tips Party welcomes all of your original tutorials, craft projects, room reveals, recipes, furniture makeovers, as well as your decorating, cleaning, & organizing tips. If it makes our lives beautiful, easier, cleaner, or yummier, we want to see it! I look forward to seeing your creations. Thanks for hosting Beth, have a great week! note to self….get a bunny! 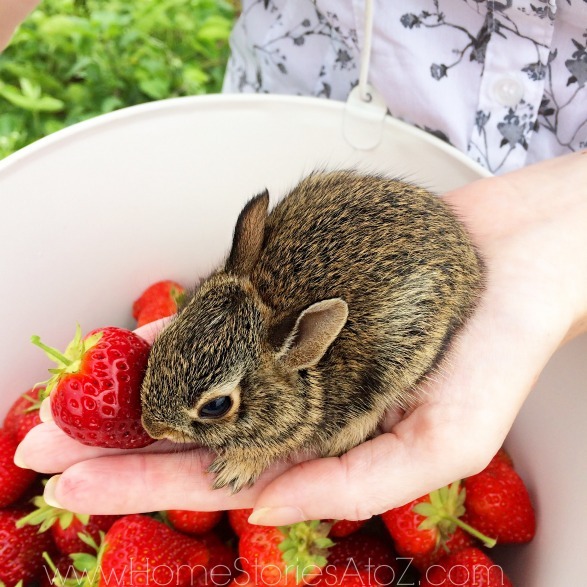 Strawberries and a bunny! Such a great photo! Thanks so much hosting again this week. What a cute photo! Thx for the party, Beth! Awww – I’ve NEVER seen a bunny that tiny – that’s just too cute for words !!! Beth, that really is the cutest baby bunny ever! Was it in your yard? We have baby bunnies galore this time of year, but I have never been close enough to touch one. They always scamper off 🙁 Thanks for another fun party! The bunny is so tiny and so cute! Thanks so much for hosting! What a precious bunny. It really pops with the strawberries. Glad you all had a fun day! Thanks for hosting.